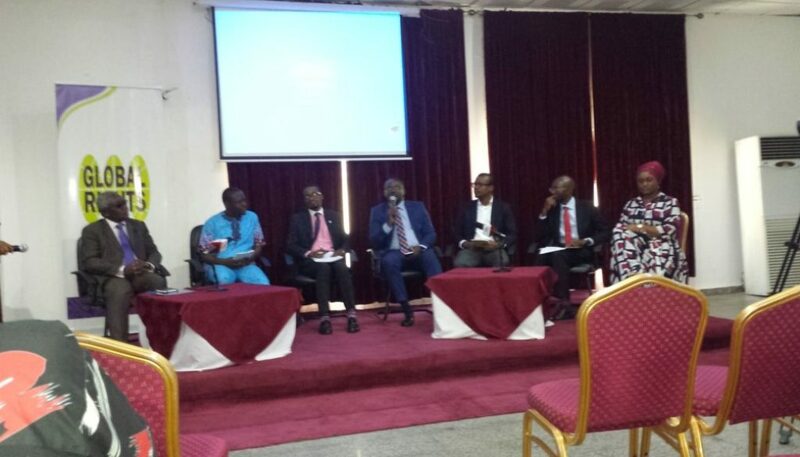 Global Rights organized a town hall meeting, which brought together stakeholders in Nigeria’s energy sector, including government, coal mining companies & their host communities, the media and civil society. The meeting was for a debate on coal in Nigeria’s energy mix considering the challenges the country suffers from energy deficit that is negatively affecting its socio-economic development and practically every other part of its national life. Because energy sources in Nigeria can no longer meet demand, the Federal Government, therefore proposed alongside with other sources to meet 30% of Nigeria’s energy local need demand from coal energy without considering the implication of utilizing coal as a source of energy in Nigeria. Looking at an overview of global trend on coal energy, coal was accountable for emitting 14.2 gigatonnes of carbon dioxide (C02). That is 44% of all energy associated carbon dioxide emissions and more than one-quarter of all greenhouse gas emissions. In other words, no other energy source other than coal contributes as much greenhouse gas emissions. Furthermore, digging up coal to generate electricity stirs out emissions that escalate greenhouse effect and because coal is pure carbon, it is one of the enormous sources of climate change. However, coal is burned to manufacture heat and electricity that emits a lot of CO2 along with some quantities of methane (CH4) and nitrous oxide (N20). (Friends of the Earth International, COAl ATLAS 2015). Usually, producing electricity from coal is harmful to the climate, most gas powered plants releases only half as much as carbon dioxide as modern coal-fired power stations. This is why most coal mining companies in advanced countries are shutting down because of the enormous effect it has on the environment and health of the people which in turn will adversely affect sustainable development. Nigeria really need to consider the concept of trade-off, looking at the cost of ownership which covers short term benefit and long term cost. As a coal mining company in Okobo community in Kogi State is already affecting the people and their sources of livelihood. Nigeria’s proposed utilization of 30% of coal is definitely going to jeopardize our commitment to the Intended Nationally Determined Contributions (INDC) to The United Nations Framework Convention on Climate Change (UNFCCC) Paris Agreement. Focusing on coal as energy source will only give us short term benefit and long term cost, as a country we should look at other sources of energy which will benefit us more in the long run. In addition, the Federal government of Nigeria could consider cleaner alternatives to coal such as windmill energy: which is dependent on available wind, has no impact on landscape and no emission of carbon dioxide, Biomass energy: from wood, crops, landfill gas, alcohol fuels and garbage. By using biomass in power production instead of fossil fuel, C02 emissions are significantly reduced. Hydro power plants have a long economic life with no fuel cost and lastly solar energy which is the fastest growing renewable energy source. All these are cleaner and achievable sources of energy which we could take as a country to meet our energy demand.